In our country, the third Monday in February, we observe a federal holiday in honor of George Washington’s birthday (which actually is on February 22). That night for dessert in our house, we’ll have a cherry dessert. Because, you know, he cannot tell a lie. Last week, it was Groundhog Day. We have ground hog for dinner. The children usually don’t catch on to this until they’re six or so. This year, I was all out of ground hog, so we had smoked and sliced hog. Crispy. Just the way I like it. A few days from now is Valentine’s Day. There'll be candies and cards and heart-shaped goodies galore. We’ll talk of love, we’ll hug and kiss, we’ll make construction paper hearts with accordion legs and arms. And, oh Snow Days. There’s homemade donuts and hot chocolate. There’s flushed cheeks and laughter. There’s the yeasty warmth of a full kitchen. There’s an entire day of sledding and games and reading books and chatting. It’s not just for children; all of my siblings (and sometimes our friends) continue to show up too. You have a real job? Then take off work. College wasn’t cancelled? You skip class. Even the husband will take off at lunch and come up in hopes of a hot donut before he heads back to the office. Birthdays? Don’t even get me started. We have birthday weeks more than we have days. Meals. Desserts. Parties. Gifts. Special dates with various parents. Sleepovers. You pick. The day you were born? Your grandpa will call you the moment the sun is up. Your aunt’s call is never far behind. Of course, there’s the major holidays. They’d each require their own week of posts. Don’t even ask me or my siblings about the year my parents were on vacation over Easter. Two years ago. I know we’re all adults; don’t judge. It was traumatic. I still don’t want to talk about it. We celebrate in this house. We celebrate everything. Anything. All the time. The culture is joy. Life is meant to be lived with gusto, together. It’s building memories for a lifetime. It’s building community. It’s building holy moments from the mundane. It’s building a family with purpose and rejoicing and laughing and crying. Unlike many of my parenting practices where I cover them with prayers and hope that it’s successful – I know this works; it’s how I was raised. I believe celebration is holy. Celebrating the delights and special moments, the everyday moments and holidays, both major and minor, builds a practice in my children’s lives to see God. Everywhere, in everything. Celebrating the happy moments keeps us in tune to remember the painful ones, the times of loss, as well. That time of year when the leaves color the world red, yellow, orange, even brown, when my parents remember the twins they knew for only hours? I know when it’s coming. That gray day in the winter when my sister lost her first baby, whom we never got to meet? I grieve every year. When the sun blazes hot and we start to think about back to school, my kids ask about two precious children, our first foster placement who went to live with their dad, and they remember the joy and pain of it all. By celebrating all of life, my children’s hearts and minds are turned towards remembrance, of both the heartfelt and the heartbreak. As I long for my every mothering practice to be, this one is, at its root, about Jesus. It’s just as He modeled for us, sitting around a holiday table with those that He loved, preparing Himself and them to endure the hard times ahead. We do the same. All of it a binding together. We break bread; we drink wine – together. We serve one another. We remember. As my children learn to rejoice well, they also learn to grieve well. They learn that all of life, the hard, the happy, the desolate, the abundant, all of it is a gift. And we celebrate. 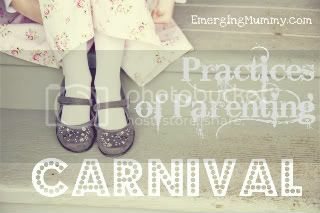 Today I’m linking up with the Practices of Parenting Carnival. It is truly a beautiful collection; you will not regret the time you spend there.